Will we allow a small group of allegedly corrupt individuals to define our party and our neighborhood or will we get involved and fight for something better for our children? Some of the recent local headlines concerning politicians, both Republican and Democrat, can be discouraging but we must remember that WE are the people. We are the taxpayers, the volunteers, the campaigners, the donors and voters. Our club and our party belong to us and they can only be taken away if we fail to preserve them and replenish them with our efforts and by bringing in new people. This is a critical moment for the Republican Party in Queens. Candidates and party leaders need us, the rank and file, to gather petition signatures, run as Committee Members, raise money, and volunteer to spread their messages by canvassing, volunteering and placing lawn signs. 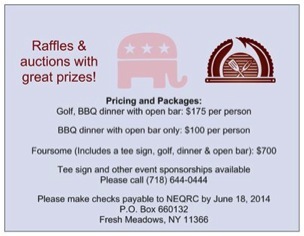 There is a lack of Republicans in Queens willing to do these things at the moment, perhaps understandably. But that puts power in the hands of rank and file Republicans. We can get involved and choose the leaders we want to support, including new ones. Corruption, cronyism and incompetence do not have to rule the political landscape in NYS, NYC or Queens. Queens Republicans deserve a lot better. We have more power than many of us realize. But we must be active, not passive. If we sit back and don’t get involved, our silence implies consent and we have no right to complain. The NEQRC exists to give local Republicans a voice and it certainly has, but it’s just the beginning and it only continues if we keep it going together. Will we allow a small group of allegedly corrupt individuals to define our party and our neighborhood or will we get involved and fight for something better for our children? It really is in our hands. 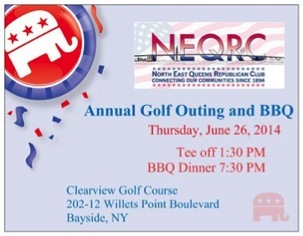 In 2014, the NEQRC and its members have been working to rebuild the GOP in Queens by rebranding the party and hosting interesting meetings and community functions. Our guest speakers have included National Review Editor Jay Nordlinger, Casale Group strategist Lynn Krogh and candidate for NYS Governor Rob Astorino. We are the only club that hosted an open candidate forum with both Stephen Labate and Grant Lally, the Congressional primary candidates in cd-3. We held our second annual free family Easter Egg hunt in Bowne Park, delighting over 100 local children and their parents-who just might remember it when they go to the polls in November. All of these things help to build the reputation of the club and the party. We have more planned for the rest of the year, but we need your help. I ask you to please attend our only fundraiser of the year, on June 26th. Play golf with us during the day and/or have dinner, drinks and fun with us in the evening. We make a difference in our community and we have a blast doing it. Our club’s message has been clear all year. Everyone is invited. Join us and help rebuild the party. It’s yours. This entry was posted in Meetings/Events, News, Opinion. Bookmark the permalink.